If you’d have to analyze a normal work day on your computer, how would it look like? What are the common applications that you open? Which website do you spend the most time on? It can be quite difficulty to calculate those numbers manually, and it is likely that you may be way off. That’s where time tracking software like ManicTime can help. The program monitors all PC activities automatically, so that you know exactly what you have done on your PC at a specific time of the day. The program is offered as a limited free version and commercial versions. ManicTime Free comes without program support and advanced features like password protection, categorization of applications or advanced search functionality. The free version of the time tracking software tracks and analyzes application usage automatically, and creates charts and statistics about the general computer usage. When you start the program for the first time, you will see a tabbed interface that is divided into two main areas. The area at the top of the program window displays the current day and a time bar that visualizes computer, application and document usage on the computer. Different programs and documents are displayed with different color sets. Hovering the mouse over them displays tooltip information about the program, time and duration as well as document titles and related information. The lower half of the screen displays the active application or document (e.g. browser tab) and totals combined (e.g. how long you spend in the Firefox browser). The statistics tab displays various information like the top applications and documents, top computer usage or day durations. You can pause tracking at any time with a right-click on the program’s system tray icon and the selection of “Go off the record”. The information that ManicTime present can be a real eye opener for some users. Maybe you realize that you spend to much time gaming on Facebook or your favorite Flash games site, or watching movies on the computer. I personally like the fact that the program keeps not only track of programs but also window titles, so that you can for instance see how much time you spend on specific websites in your web browser. 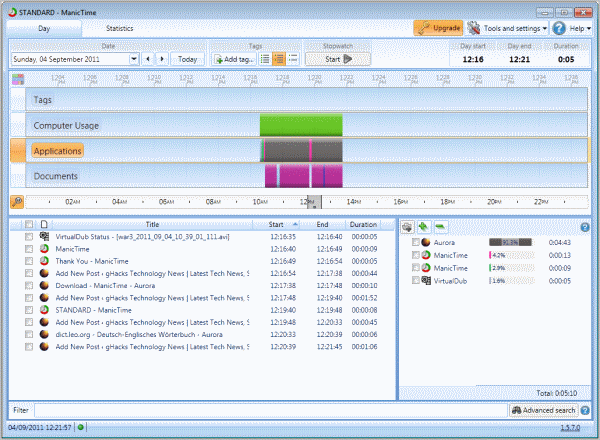 ManicTime is a handy time tracking software for the Windows operating system. Windows users can download all available versions of the software from the developer website. The program is fully compatible with 32-bit and 64-bit editions of the Windows operating system.